Once aboard the space station, however, things start to go terribly wrong. A culture of single-celled organisms known as Archaeons, gathered from the deep sea, are to be monitored in the microgravity of space. The true and lethal nature of this experiment has not been revealed to NASA. In space, the cells rapidly multiply and soon begin to infect the crew -- with agonizing and deadly results. A recovery attempt ends in catastrophe: the NASA shuttle crashes, killing all onboard, and the space station is left dangerously crippled. Emma struggles to contain the deadly microbe, while back home, Jack and NASA work against the clock to retrieve Emma from space. But there will be no rescue. 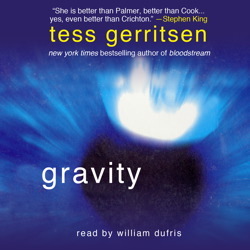 The contagion now threatens Earth's population as well, and the astronauts are left stranded in orbit, quarantined aboard the station -- where they are dying one by one...Written with an exacting eye, Dr. Tess Gerritsen ensnares the imagination with Gravity, her most steely, unforgettable thriller yet.